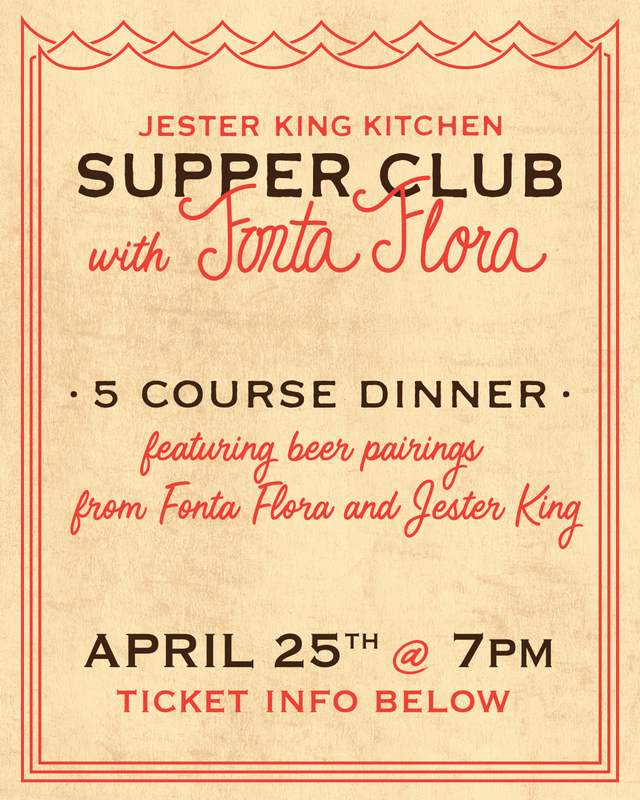 Jester King Supper Club with Fonta Flora Brewery! We're very excited to announce that for Jester King Supper Club on Thursday, April 25th at 7pm, we're partnering with our friends from Fonta Flora Brewery in Morganton, North Carolina! Chef / Brewer Obie Ferguson of Fonta Flora will collaborate with Jester King Executive Chef Damien Brockway to create a special five course pairing menu featuring beers from both breweries! Tickets to the dinner can be purchased at the link below. The pairing menu is below as well. Jester King Supper Club is our monthly pairing dinner put on by our excellent culinary team at Jester King Kitchen. Our Supper Club debuted in March and will feature exciting dishes, pairings, formats and collaborative partners throughout the year. We hope you'll join us!